Do you enjoy international sushi, tastes from around the globe, but think it's too difficult to make at home? It does seem like a difficult feat. Even though sushi takes time and effort to prepare, it's not as hard as it looks. As much as you enjoy eating sushi at a favorite restaurant, that can be a little hard on your budget. You don't have to pay a fancy chef to make sushi! You can make REALLY good sushi at home, with practice, and these recipes will make it more feasible to give it a shot. Assembling sushi is actually easy, and you'll have the chance to mix and match your favorite ingredients - and it's way cheaper than eating sushi at restaurants. If you're using raw meat or fish, be sure you purchase it at "sushi-grade" freshness. Ask at your favorite meat counter. International sushi is even more interesting than making routine sushi. You'll be using some ingredients that you don't normally see in restaurants, and you'll even learn some breakfast and dessert sushi recipes. So, if you want to make sushi at home, grab a couple family members or friends, some chopsticks and your all-time favorite ingredients. You're going to be surprised at how much fun you can have, and how delicious and addictive making sushi can be. 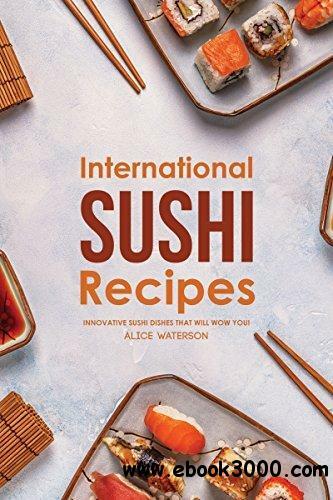 [Fast Download] International Sushi Recipes: Innovative Sushi Dishes That Will WOW You!